SO NEAR, YET SO FAR is a perfect description of the Chocolate Turtle, a New Mexico Bed and Breakfast located in the picturesque Village of Corrales. This historic farming community is found in the Rio Grande River Valley. 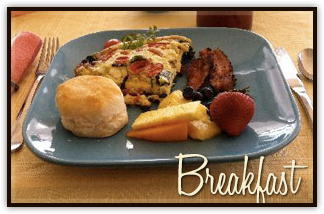 With easy access to the famous Sandia Peak Tramway, this bed and breakfast is centrally located. Relaxed and low-key Corrales, NM is so serene you'd never know that we are flanked by two of New Mexico's largest cities: Albuquerque and Rio Rancho. We are also just a short drive from Santa Fe. Explore the working art studios, historic sites, restaurants, and wineries of Corrales. Enjoy outdoor activities like hiking, golfing, biking, and bird watching. Recreation is available year-round due to moderate temperatures, 310 days of sunshine and the high desert climate of Albuquerque. 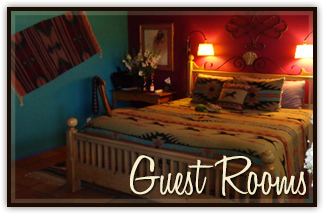 The Chocolate Turtle is a classic adobe-style home with four colorful and private guestrooms. Our portal (that's Spanish for porch) and our patio are surrounded by gardens of fragrant, southwestern plants. The rustic gazebo offers a magnificent view of the ever-changing Sandia Mountains. A continuous parade of wildlife, including bunnies, quails, roadrunners and hummingbirds, provide ongoing entertainment. Fresh flowers and delicious chocolate turtles await you in your room. And did we mention the scrumptious breakfasts served on the portal (weather permitting) or in the cheery breakfast room each morning? A stroll on the walking paths along the nearby historic acequias is like a step back in time as you pass orchards, vineyards, and horse farms. In fact, you may even get to pet a llama being walked by a villager. 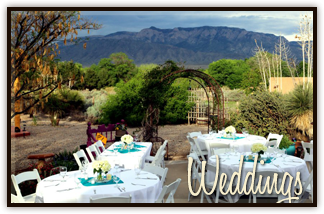 The Sandia Mountains afford a beautiful and unique backdrop for weddings, outdoor receptions, and other types of celebrations. Our meeting space provides a great way to retreat from the office hustle. This Albuquerque area bed and breakfast is a perfect choice for the business traveler, offering late/flexible check-ins, early breakfasts, business services and free high-speed wireless Internet. Whether you live across the country or just over the Rio Grande, the Chocolate Turtle Bed and Breakfast is the perfect getaway. New Mexico Homes, a resource for Corrales, NM Real Estate, recently featured us in an article. Read it here: Southwestern Comfort and Charm at Corrales' Serene Getaway. "We stayed here for a couple of days and had a lovely time. The location is perfect. It was easy to get to everything we wanted to do and morning coffee on the patio included a great view of the Sandias and the delight of watching the quail go about their morning forage. The hosts were very friendly and the accommodations were comfortable. Should we return to the area, we will definitely stay here again." "We could not have had a better time. Every little detail was taken care of. I feel we got lucky the first afternoon with the weather break and were able to have snacks and drinks on your lovely patios - we tried them all. Loved watching the quail, doves, and bunnies chasing around and eating the cracked corn. You did an amazing job of setting up the snacks and drinks and then dinner was so wonderful. I loved the table colors and the food from Los Cuates was delicious and you just couldn't have done a better job. Also, thank you for setting up the table again for cake and glad you got to enjoy a piece. It was my best birthday ever and you made it amazing. All our kids and grand kids loved it too, as well as a couple friends. Breakfast was also delicious and enjoyed meeting Rico and Zorro - very well behaved! 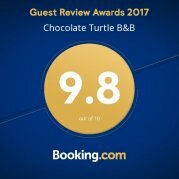 Your place is magical and you have thought of every little detail - loved the fresh flowers in each bedroom and, of course, the chocolate turtles. The decorated rooms were over the top and loved all the brilliant colors. Thank you again and can't wait for another event where we can return to your B&B."